Thank you for submitting an adoption application. Please provide as much information as possible. You may add comments in a field at the bottom of the form. Your application will be kept in our database for six months. Are all members of household in agreement on adopting a Whippet? Does your rental agreement allow pets? If you currently have a dog, have you ever introduced it to another dog? If yes, how did it react to the other animal? If you've owned another sighthound breed, which one(s)? Where will your Whippet be most of the time? How many hours per day will your Whippet be alone without a human present? How will you manage your Whippet when you're away from home? Where will your Whippet sleep? How do you plan to exercise your Whippet? Do you object to a personal interview and visit to your home by a WRAP volunteer? 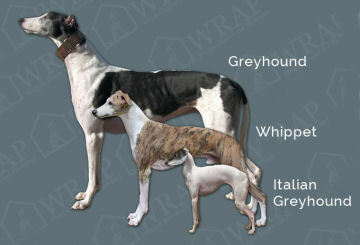 American Whippet Club listing of reputable member-breeders located throughout the USA.